Blogging seems to be one of the most popular activities nowadays, with every second person you meet having a blog of their own. Blogging is a great way of expressing your own opinions about a particular topic or subject, and can help you formulate public opinion. But all that is possible only when you are able to make a name for yourself as a blogger. The popularity of your blog, to a large extent, depends on the presentation of your blog. What your blog looks like will make or break the deal. If you have a good, well designed blog, that is sure to attract a large number of followers. But if you don’t, then you’re likely to miss out on followers. You may also see News Blog WordPress Templates. This WordPress Theme is perfect for websites that are dedicated to traveling related blogs or even for sites that deal in travel and tours. The theme offers a user friendly interface with easy to use features and options. Live customizer allows the user to view changes before putting those changes online. Bootstrap design makes the theme not only responsive for various screens but also compatible with various browsers. The theme is absolutely SEO friendly in nature, well documented and includes various features such as Google fonts and 24/7 support. Different layouts and custom widgets. Along with these features, the theme is known for its clean and elegant design and simple to use customizer. This theme is proper for any food based website. Mostly it is used by restaurants and food joints where people can go for online booking and order. The mega menu allows creating various categories easily. The user can use and select from various plugins, sliders and can make use of features like Google map. LaRead offer the users a perfect WordPress theme for those who are into blogging and are about to come up with a blogging site. 5 different interfaces are offered for publishing. The theme offers various other features such as 17 post formats, 12 widgets and 51 PSDs. 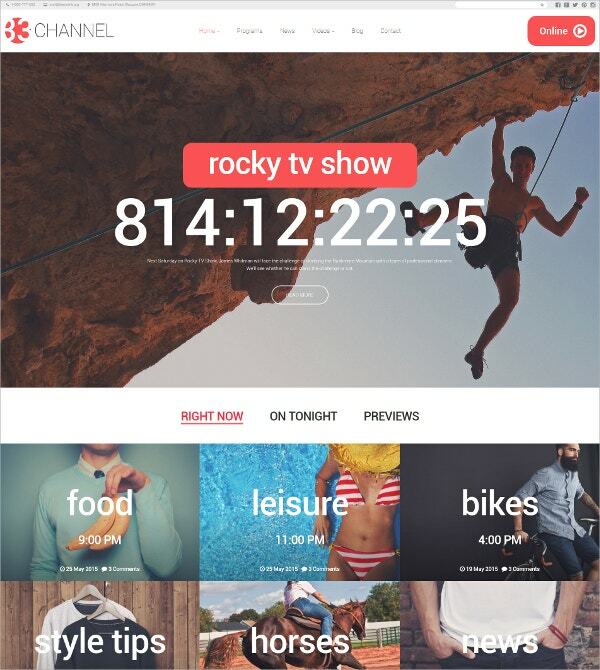 As the name suggests, this theme is perfect for sites features TV shows, movies and other shows available to be watched and downloaded. It supports multiple languages for various users. The theme is well supported by widgets, Google maps, SEO features and also contact forms. 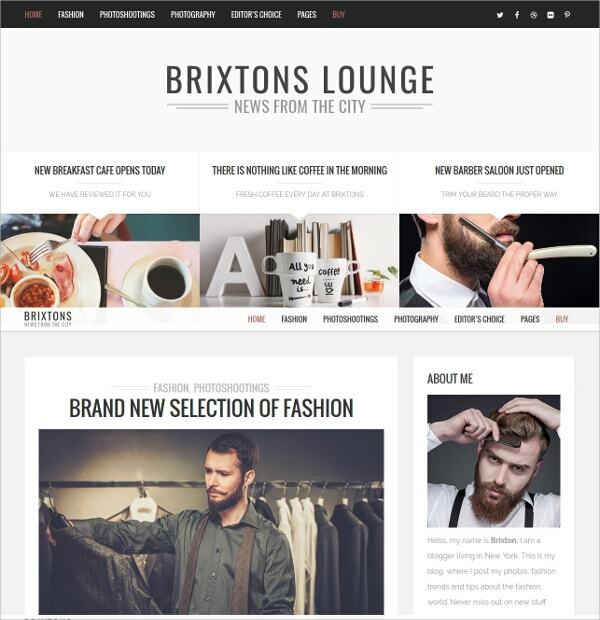 Whether it is about story telling or blogging, Brixton offers the best WordPress theme for such websites. Widgets for social share are offered. Ad space can be selected and customized. Along with this there are other features such as search bar in the theme. If you have many things to express, but you are not getting the right medium to do so, use Blink to create your blogging site. The customizer feature allows you to preview the changes before finalizing them. Multiple layouts can be selected for homepage and different other pages in one click. The user can select from as many as 600 number of Google fonts. The theme has the facility of having regular free updates from time to time. Also it offers free service support of one year. Hologram is developed for users who wish to have a great looking personal blogging site with simple efforts. Despite of being a simple theme, it offers a number of amazing features. 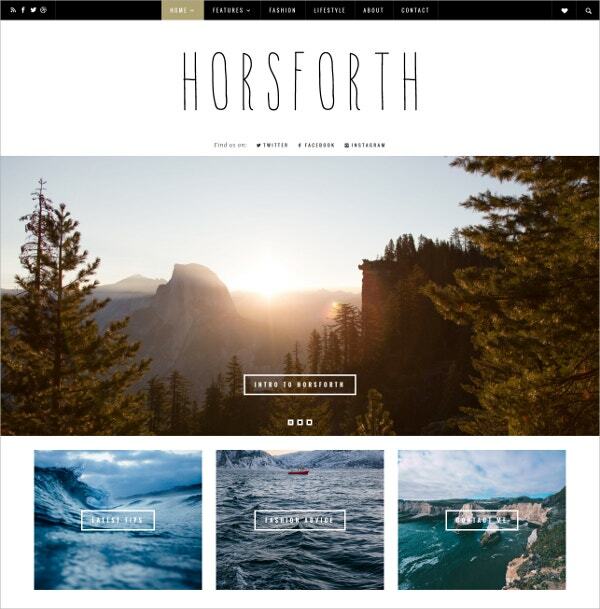 Not only the theme is responsive in nature but also is clean and easy in its interface. The simple to use wordpress theme comes along with a strong admin panel and also is fully customizable in nature. Ignite is a free to use blog theme offered by WordPress. 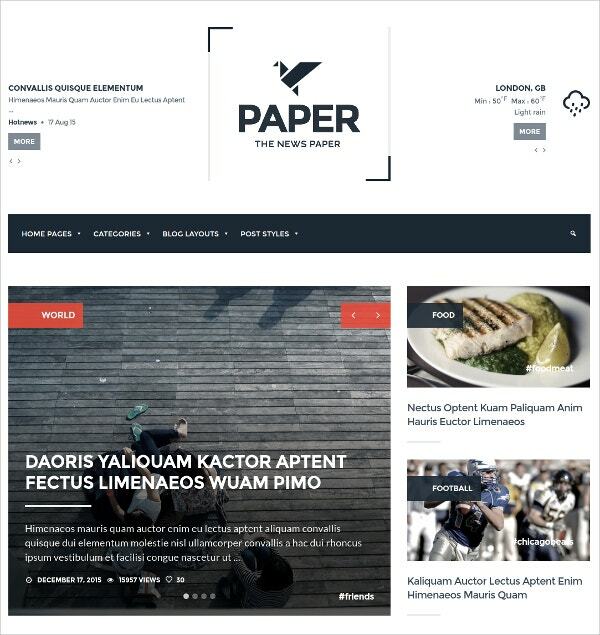 This simple to look WordPress theme is amazing to use and is full of some most important features. It is mobile responsive in nature and is compatible with all browsers. This particular blog theme is actually developed for blogging sites that are for personal use of a particular user. Chic Blog is not only for site owners who are into blogging. It is also for the site owners who wish to promote and advertise their brand in a big way. It supports theme customer to better looking of the site. The theme features various layouts, widgets and other features that make it perfect. 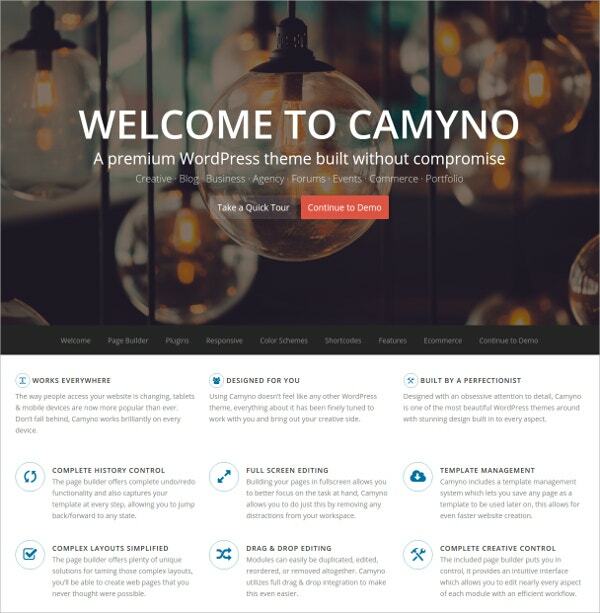 Camyno offers a multiple use website theme for almost everything that you wish to come up with such as a blogging site or an ecommerce site or just a community site. Updates are automatic from time to time. 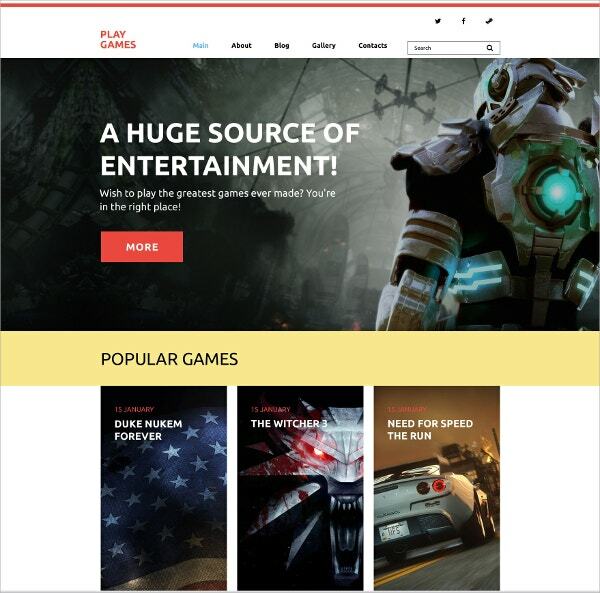 The various features of the theme is supported by demo content and also support. Colorado theme is developed for blogging site where the site owner can not only publish the blogs but make it visually attractive. 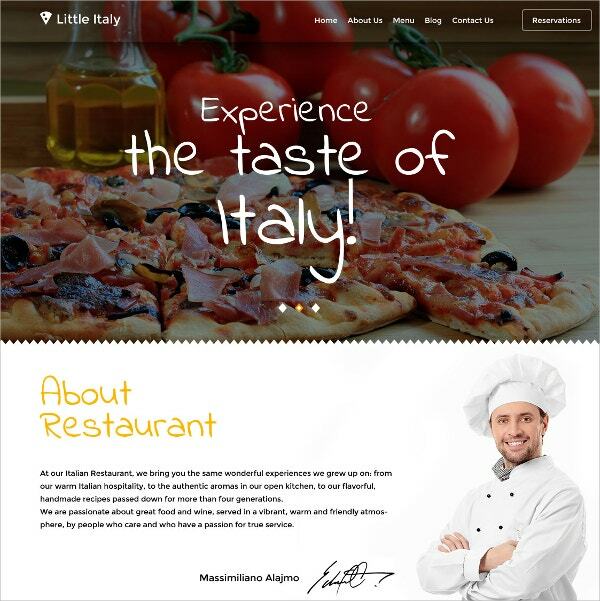 The theme is mobile responsive and is also retina ready. The theme is well supported with plugins, post formats and widgets. Kustrix is designed for fashion blogging site or even for the ecommerce sites dealing with fashion items. The SEO friendly theme is also highly responsive. The theme is very much well documented and features widgets and Google fonts that can be helpful. 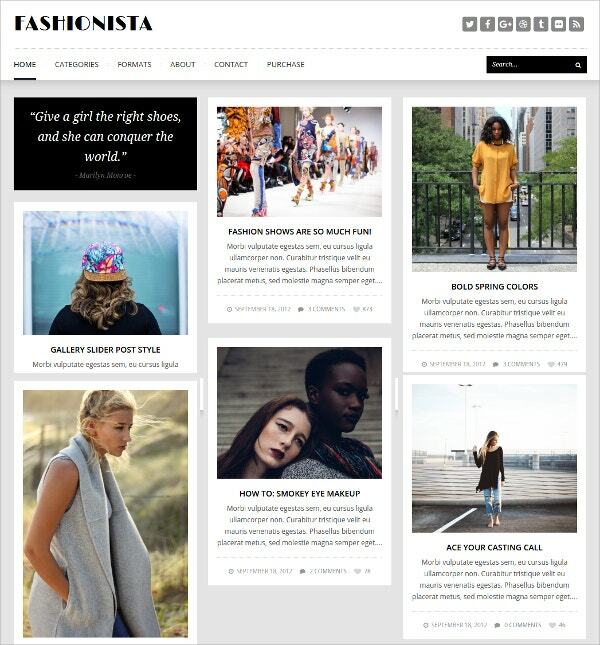 Fashionista theme has a clean and user friendly interface. It is developed for blogging sites or even for portfolio sites of photography or personal. Multiple formats for posts are provided. The theme Fashionista along with above features also offers infinite scrolls, great navigation and load more options. Features with various fonts, graphics and themes. 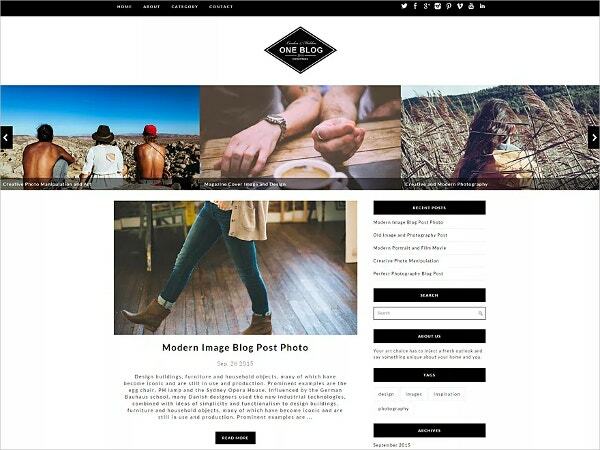 Altogether it is a simple to use WordPress theme but can be a great personal blogging site theme for many. SEO friendly design to provide great traffic. The theme has a simple to view interface but is well supported by these modern features. The theme features many more options such as dropdown menu and uploading profile picture. Multiple languages supported and MotoPress Editor. The theme is SEO friendly and supports Google maps and stock photos and offers 24/7 support. Various layouts for creative design touch. 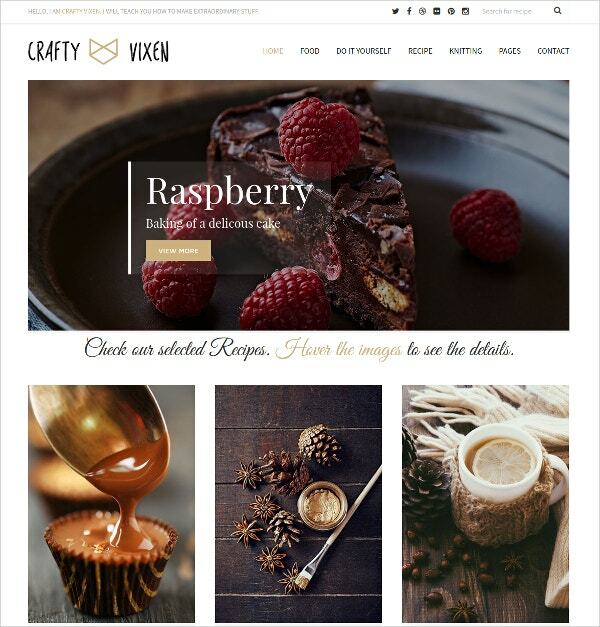 Vixen is an SEO optimized WordPress Theme that has a clean interface and is easy to use with various features. Navigation option for various pages. 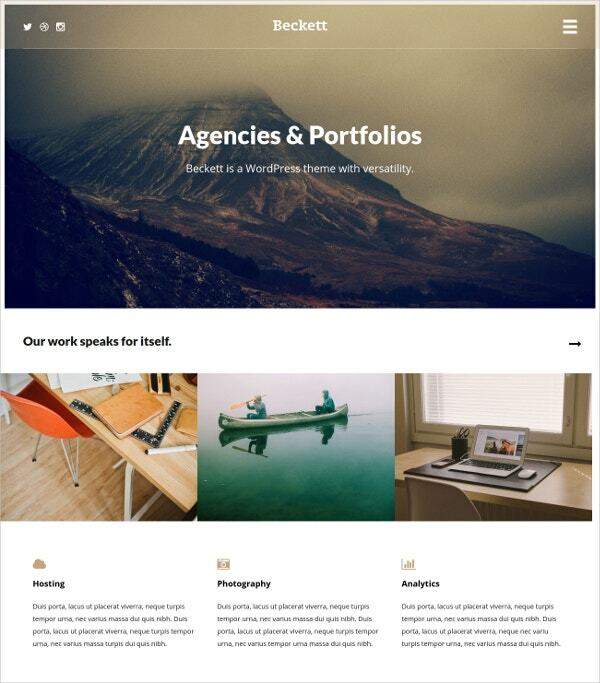 The fully responsive theme offers multiple portfolios, animation styles, unlimited Google fonts, custom colors and also widgets. Free installation with demo content. 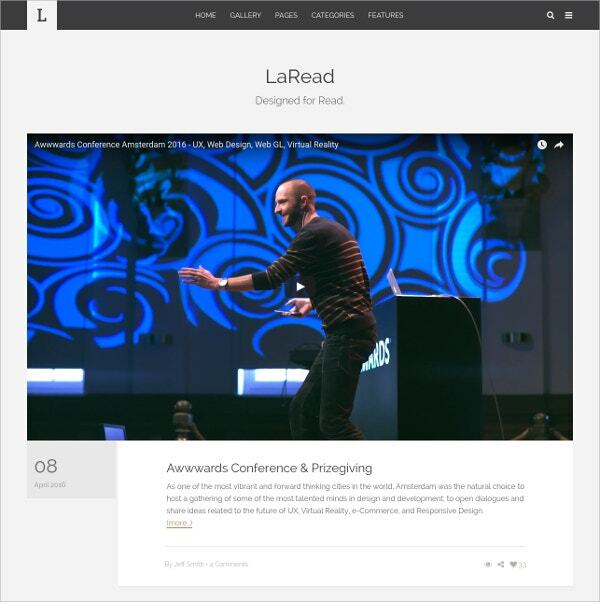 For page loading, the theme uses animations and displays all the blogs in great style. Fitnesys is a fitness blogging site theme that is SEO friendly and is very responsive to be compatible with every device screen. It features various layouts and designs. The retina ready theme has live customizer and also features a number of widgets in it. 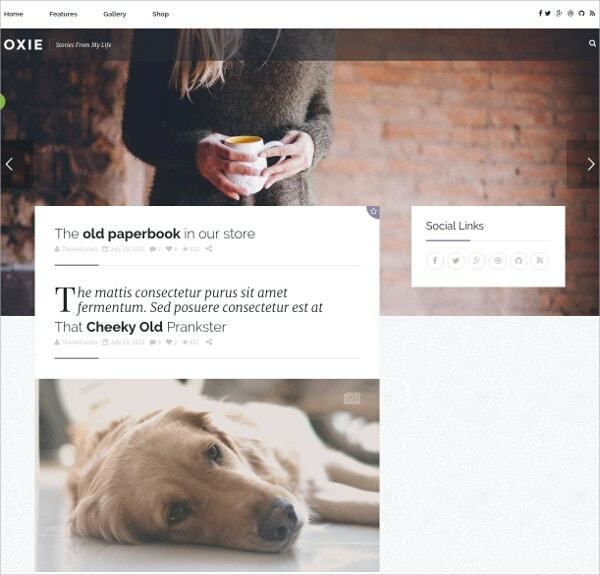 Oxie is responsive and a beautiful looking WordPress Theme that can have blogs over various topics such as travel, food, fashion and lifestyle. It supports header builder and multiple languages. Apart from these features, the theme offers various modern features such as Google fonts, icons, shortcodes and widgets. If you wish to make your stories much powerfully features, then this is the theme you are searching for. Pointed is also best for news sites. Modern features such as social media, color options and ads. 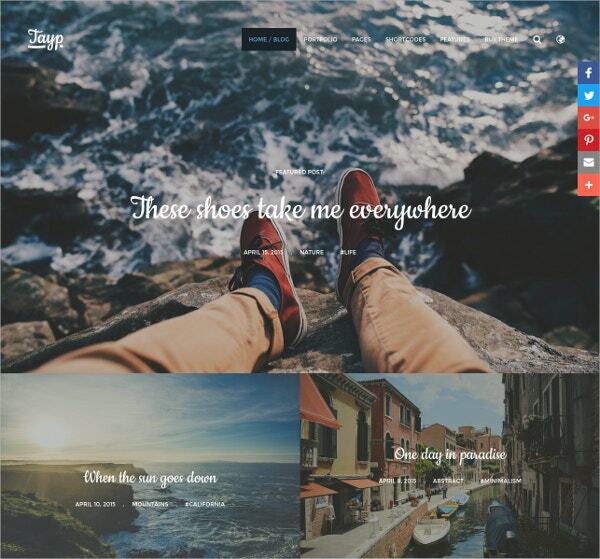 The theme is full of advanced typography, widgets, cover styles and many shortcodes. Gallery with images and videos. Clean is a Responsive theme and is very much compatible with not only different devices but also various browsers. 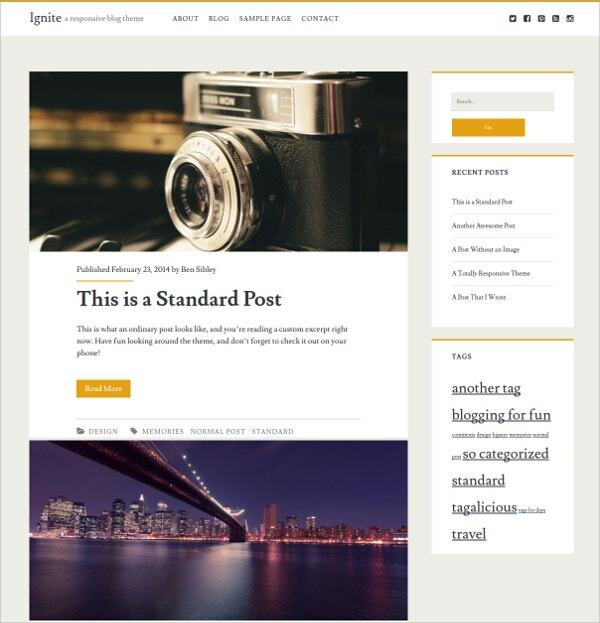 Spike is a colorful and bright WordPRess theme for blogging site. It is fully responsive in nature and is supported by live demo. It is supported by a powerful option panel and translation option. 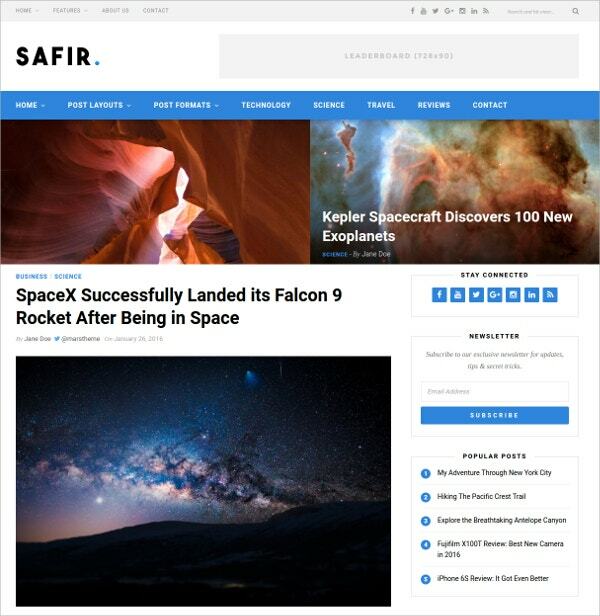 The theme has been designed and coded with CSS3 and HTML5 techniques. It is also supported with widgets and shortcodes. Equinox is a responsive WordPress theme that comes with step by step guide and various free plugins and widgets. Dropdown menu, adding or extra widgets and having a profile picture are added features. 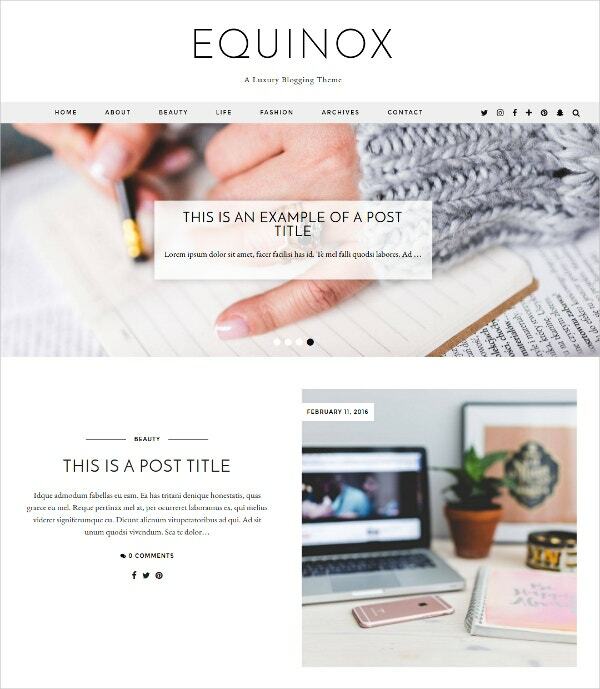 The SEO friendly theme Equinox offers a clean and simple way of publishing great blogs. 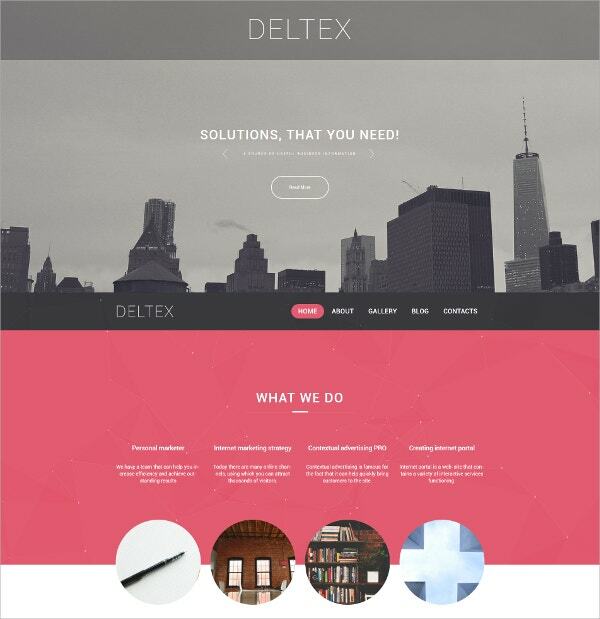 Deltex is meant for business related website. 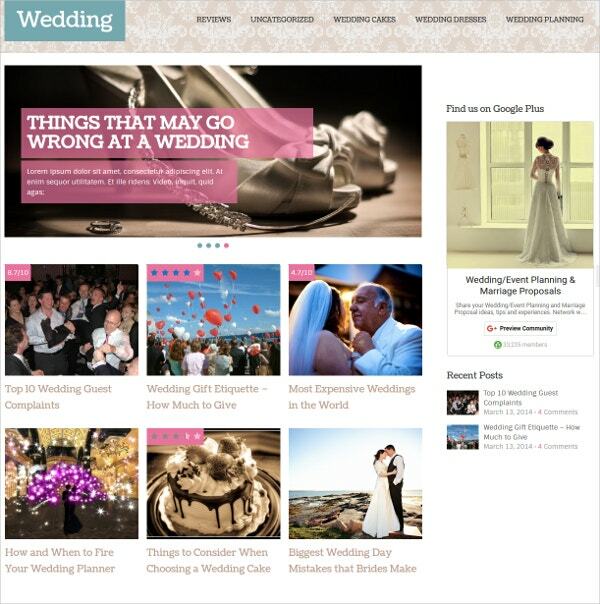 The WordPress theme is SEO built and is also responsive to be compatible with all screens. It also features MotoPress Editor and MotoPress Slider. The theme is available in multiple languages, has stock photos and is supported by 24/7 support. AvantGarde provides a clean WordPress Theme for sites featuring personal blogs on travel, lifestyle and other related subjects. Unlimited sidebars and menu with sliders. 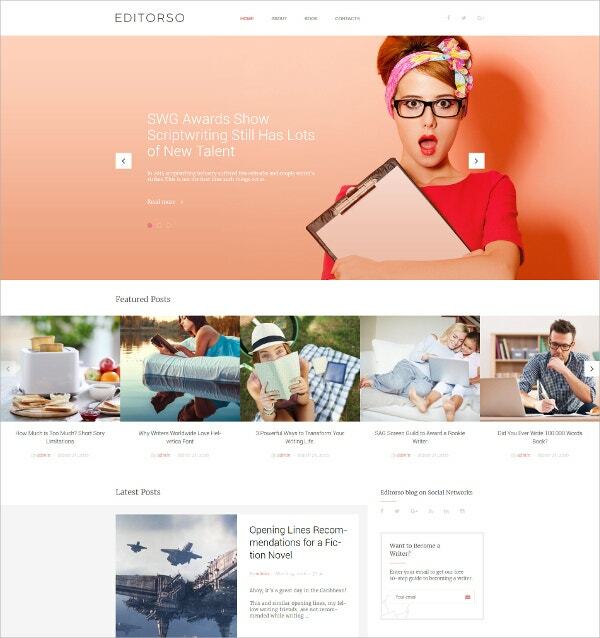 It is a SEO friendly and responsive theme with various other features too such as widgets and shortcodes. Unlimited layouts, formats and colors. It takes just a minute for the theme to get installed. It is designed on Bootstrap technique and has a powerful admin panel. 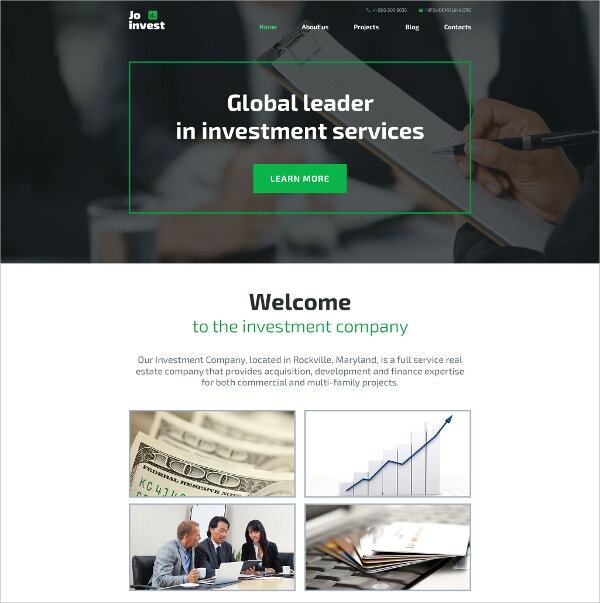 Jo Invest is a WordPress theme developed for business related websites that features the concepts of investments. It features needful options such as contact forms and newsletter subscriptions. The theme is well supported with varied languages and other features such as widgets and Google maps and fonts. 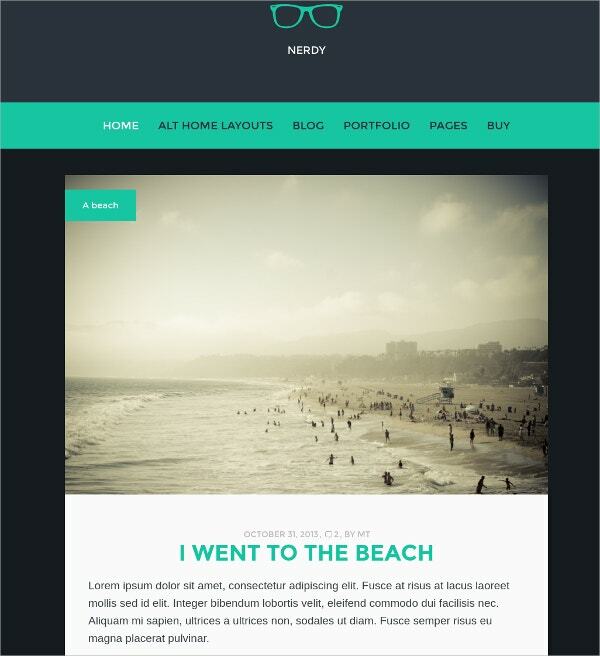 Nerdy WordPress theme is for blogging sites as well as the portfolio sites. The theme is available with various features. It has unlimited number of Google fonts to try. The theme comes along with various modern features such as child theme, slider, social share and is highly responsive. 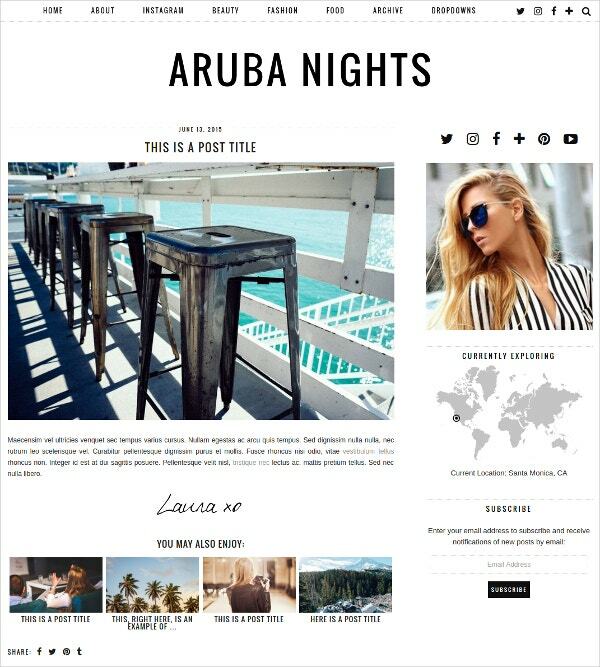 Luxury is a WordPress theme that is meant for sites that focus blogs on the sophisticated and elegant topics such as lifestyle. Menu and logos are the main attraction of this theme. 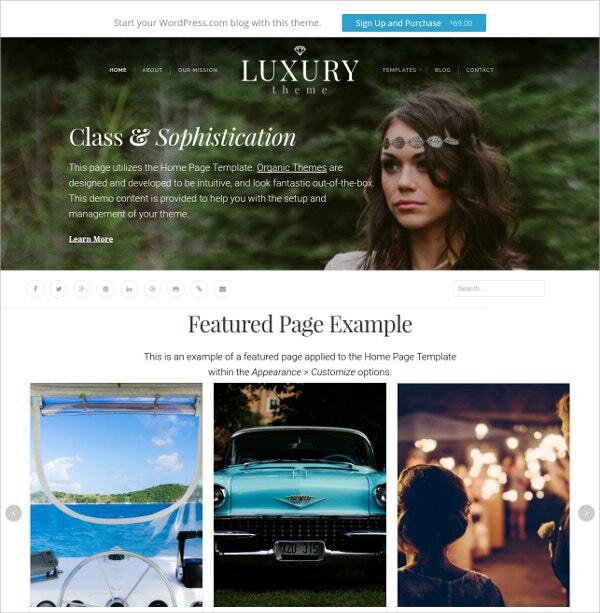 Luxury theme is well supported by a number of widgets, gallery and other features for portfolio templates. Beckett is mainly the WordPress Theme for portfolio websites. It is for websites that features blogs and images of professionals such as photographers. It also features video support and templates. The responsive theme is compatible with various browsers and has a life time support available. As the name of the WordPress theme suggest, this is for websites and blogging sites featuring news or journalistic blogs. It features various fonts and designs. Editorso is SEO friendly and responsive in nature and is designed based on the Bootstrap technique. Are you a blogging enthusiast and looking to design your own WordPress blog? Then you can definitely consider various WordPress Blog Templates available online that come with eye-catchy design, color schemes and organizations ideal for any kind of blog. These blog templates let you give desired look to your blog in just a few minutes even without any coding knowledge. The features these carry include responsive layout, custom color scheme, multiple font options and more. Have you started a blog of your own recently? Or maybe you already have a blog, but haven’t got too many followers yet? One way of solving your problems is to get your hands on WordPress blog themes. 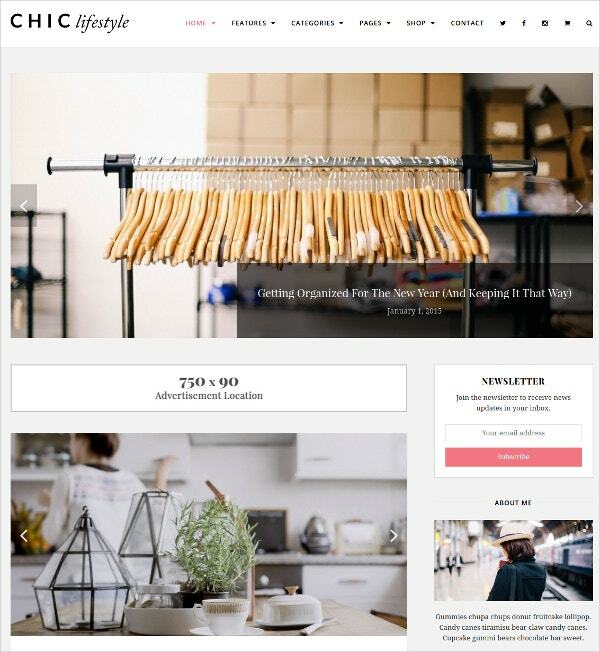 These themes have been specifically designed for bloggers like you, and can help you out. 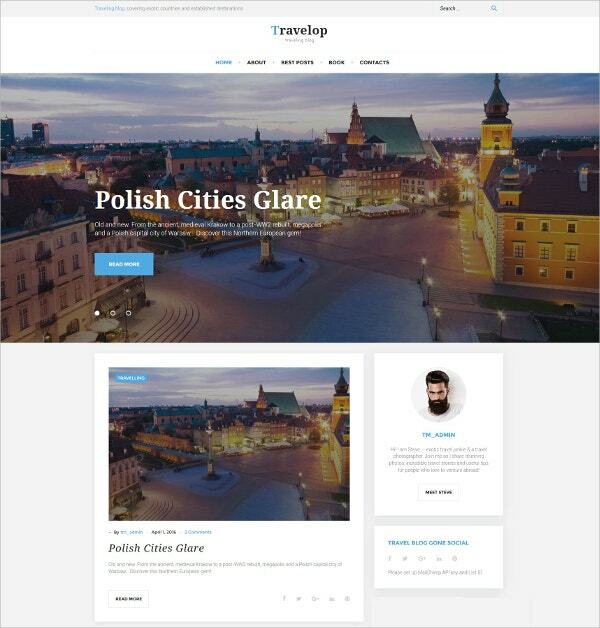 You can also see Travel Blog WordPress Templates. Educational Blog WordPress Themes- Some people run “how to” blogs, or educational blogs which strive to teach the viewers something. It could be cooking, handmade items, DIY and so on. Such blogs require special wordpress themes. Entertainment Blog WordPress Themes- Entertainment and the glamorous and glitzy world of films form popular topics for most blogs. If you’re planning to start such a blog, you can try out some entertainment blog WordPress theme templates. News blog WordPress themes- A news blog must have a formal tone about it. It must have an official and a professional strain maintained throughout. It must be kept factual, and to the point. If you have started such a blog, you will need good news blog wordpress themes. A wordpress blog theme would allow you to design your blog any way you want. Downloadable WordPress blog themes are fairly easy to use and edit. You can narrow down your search for templates on the basis of the kind of topic you deal with in your blog. That would certainly give you the template you require. You may also see Free WordPress Blog Templates. The theme template that you select must go with the overall theme of your blog. 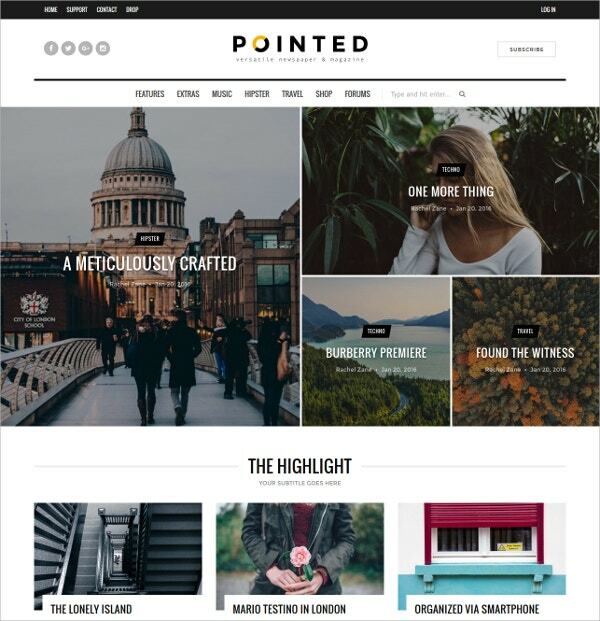 If you run an entertainment blog, you could use bright vibrant themes. A news blog, on the other hand, would need a more professional and subdued theme. Whatever the purpose, do not select themes which contain too many patterns and designs. The purpose of your theme is to support the content on screen, not draw attention away from it. Before deciding upon the template, weigh the pros and cons of each kind of template displayed to you. If you have decided to start a blog and are looking for fabulous themes, then you have come to the right place. Take a look at some of the free WordPress blog themes on template.net, you’re sure to find the one you’re looking for! You can also see Video Blog WordPress Templates.